Living at the heart of the Laurentian campus is safe, convenient, and best of all, a great way to socialize. *A refundable damage deposit is included. ** Indicates a Federated Residences. 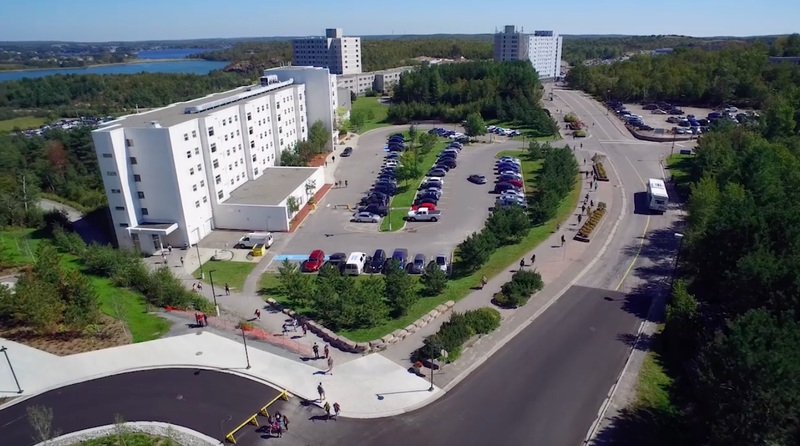 Apply to residence and accept Laurentian's offer of admission by June 3rd, 2019. What does Residence at LU offer? Access to fresh marché-style dining experience. You’re now a university student and chances are this will be your first time living on your own. What you’ll find at Laurentian are flexible, comfortable residences that will feel like home – only better. Here, YOU get to design your own lifestyle! It’s the main reason so many students – more than 1,600 of them – choose to live on campus. Our eight unique residences provide you with an array of options. Each residence has a different style and vibe so we’re sure you’ll find one that feels just right for you. Eleven-storey building is a traditional dormitory-style that accommodates 240 students. Each floor is equipped with television/common room, kitchen, bathrooms and each bedroom features high speed internet access, porter services 24/7 and outdoor recreational facilities. Provides accommodations for 387 students in a three-storey building with self-contained apartments (four – six person apartments). Security and support 24/7. Each apartment has a living room, kitchen, two bathrooms, storage room and high speed internet access. Six-storey air conditioned building with 55 furnished self-contained apartments (223 students) available for upper year-students, who meet credit or age requirements. Each apartment consists of four single furnished bedrooms, living room, kitchen and two bathrooms and is equipped with cable and high-speed internet access . Each floor has a lounge where guests can meet and socialize. Eleven-storey air conditioned building with 62 furnished self-contained apartments (236 students) available for upper year-students who meet credit or age requirements. Each apartment consists of four single furnished bedrooms, living room, kitchen and two bathrooms and is equipped with cable and high-speed internet access. Recently renovated, MSR is an 11-storey building with self-contained unfurnished apartments for upper-year students. 127 units which offer a one bedroom apartment-style living. Accommodates 162 students in 21 single and 68 double rooms. The first-year residence guarantee does not apply to this residence. 176 students occupy 100 single and 40 double rooms. Small sections of 12 to 14 students provide for a home away from home atmosphere. Accommodates 58 students in single rooms. If you do not reserve your residence space before the application deadline, you will need to find off-campus housing. Renting an apartment is an option for off-campus housing. Apartments in Sudbury are usually available with one-,two-, or three-bedrooms. You are responsible for buying and cooking your own food, doing your laundry, purchasing furniture (usually) and other necessities such as bed linens, dishes, cooking utensils, silverware, etc. The apartment may or may not be equipped with a fridge and stove. Cost: between $577.00 and $927.00 CDN per month, which may or may not include utilities, and usually does not include telephone or cable television. This might be a suitable arrangement for someone who is planning to study for a period longer than eight months since most apartments require you to stay for one year. Because this option cannot be pre-arranged, you should be prepared to spend the first few days in a hotel or temporary housing. For more information please contact Off-Campus Housing by email at ocho@laurentian.ca or by phone at +1-705-675-1151 ext. 1087.